With one hand, he has his horse by the bridle. With the other, he’s clutching a rifle. He’s taming the unruly beast as his companion, holding the severed head of a deer, looks on — the mountains vast and unforgiving behind them. The rugged hero of the early 1900s advertisement — painted by the Western artist William Robinson Leigh — seems to embody the strength and self-reliance America had long ago baked into its founding story. 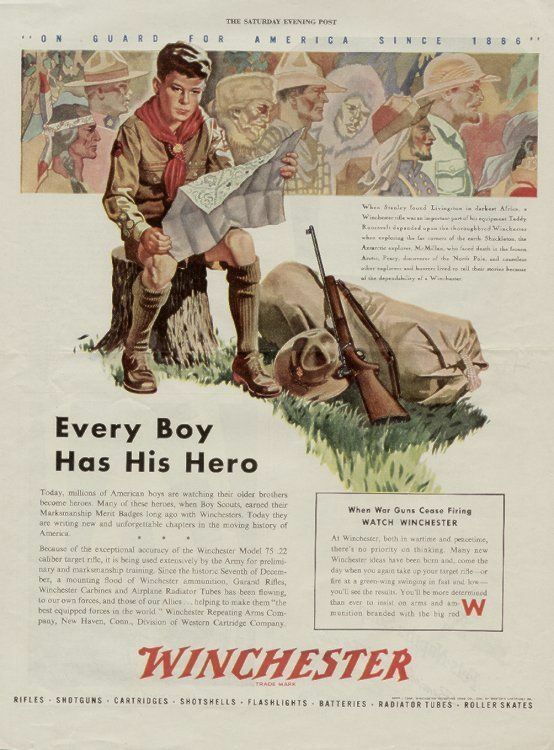 With nothing but his ropy muscles and his trusty Winchester, the ad seems to be saying that he could fulfill the nation’s earliest white founders’ ideal of conquering the wilderness. Gun culture — which has once again come under scrutiny following the shooting at a Las Vegas concert this week that left at least 58 victims dead and more than 500 injured — has long been a strong presence in American life. But where did it come from? How did guns become so ingrained in American life? And why does the United States stick to its guns — even as it suffers a dramatically higher rate of gun deaths than anywhere else in the developed world? 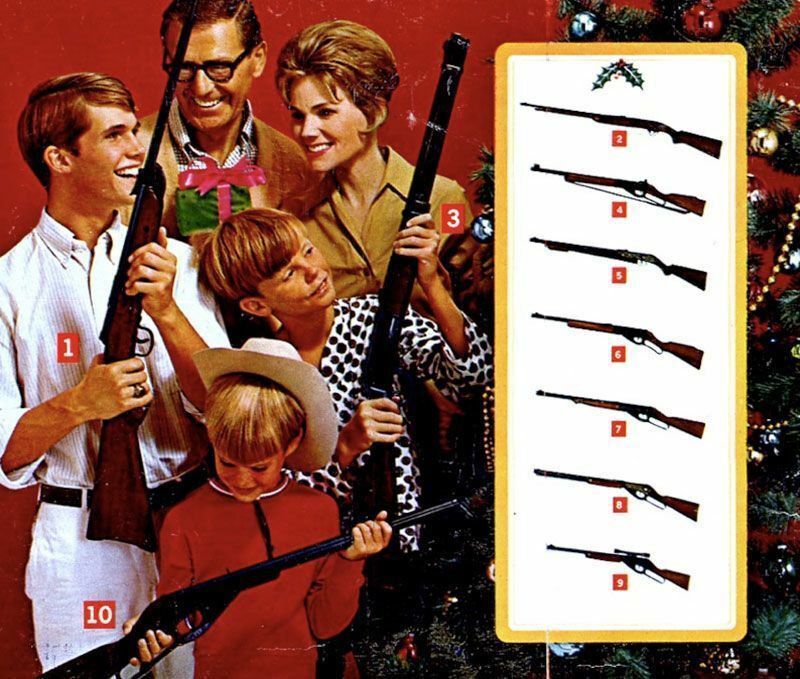 In many ways, America’s gun culture was borne of advertisements like that Winchester spot. Guns played a critical role in the violent founding of the U.S., helping white people steal Native American land and maintain a white supremacist order through the following generations. They were also regarded by the nation’s founders as a kind of protection against tyranny, an instrument for preserving freedom. “The governments are afraid to trust the people with arms,” James Madison wrote in one of his Federalist essays, describing the right of citizens to bear arms as an “advantage” over a government that seeks to oppress them. For decades, the industry made Americans love the guns they didn’t need by juxtaposing their weapons with Rockwellian depictions of family and adventure and the role of guns in the American myth. But that began to shift through the 1980s and 1990s, according to Higgins. Amid declining gun sales, manufacturers turned to fear tactics, portraying guns not only as a sacrosanct symbol of American culture, but as a necessary protection against the crime waiting around every corner. These days, as marketing research expert David Morse wrote in AdAge in 2013, such advertising largely happens “out of the mainstream’s eyes,” mostly in niche publications. But that hasn’t made guns any less visible. As the Hollywood Reporter noted last year in a deep-dive on guns in the movies, films (and video games) have long been part of the gun industry’s marketing operation. Without having to pay a dime in many cases, gun manufacturers have sat back and watched as their weapons became forever-etched into the cultural consciousness in films, like Westerns, that tapped into the American mythos — the same way the industry’s early advertisements did. If the gun industry made America the most heavily-armed nation in the world, the powerful gun lobby has worked to keep it that way. The National Rifle Association — which is funded largely by the industry it represents — has been deft at blocking both research on guns and efforts to regulate them. In the wake of this week’s mass shooting in Las Vegas — the deadliest in modern American history — the NRA has already begun its efforts to push back against the potential legislation Democrats and others have been calling for. “The NRA and its allies in the gun-rights movement want to avoid the airing in Congress of controversial issues such as universal background checks on gun sales, a ban on assault weapons and limits on high-capacity ammunition magazines” and have instead called for a review of “bump stocks,” Politico reported Thursday. Prominent Republicans, including House Speaker Paul Ryan, have also called for a federal review of the devices, which Las Vegas shooter Stephen Paddock used to make his semiautomatic weapons fire like automatic ones. But it seems unlikely that proponents of gun control will get much more than that in the wake of Las Vegas. President Donald Trump — who received financial support from the NRA during the 2016 race — has long expressed opposition to gun control and campaigned as a staunch protector of the Second Amendment. And while he told reporters Tuesday that “we’ll be talking about gun laws as time goes by,” Steve Bannon — his former chief strategist — told Axios that it is “impossible” Trump will shift on the issue.